This stunning bouquet is unique, made from enlarged Georgina Zupnik Sequins. These sequins are made from pewter sheet which I create to reflect light to produce the magical sparkling effect. When the colour pearls are added, the reflective quality of the Sequins create spectacular colour effects. I custom make these bouquets to order. This particular bouquet is approx. 9 inches wide with the drop extending down approx 14 inches from the top. I have used Swarovski pearl beads, Swarovski crystal beads, and acrylic pearl beads in a combination of different sizes and shades. I have also used lilac and organza ribbon to decorate the handle and to finish off the bouquet beautifully. When ordering please let me know what colour combinations you would like. I can create different shaped/sized bouquet (eg a round shape rather than tear drop shape). 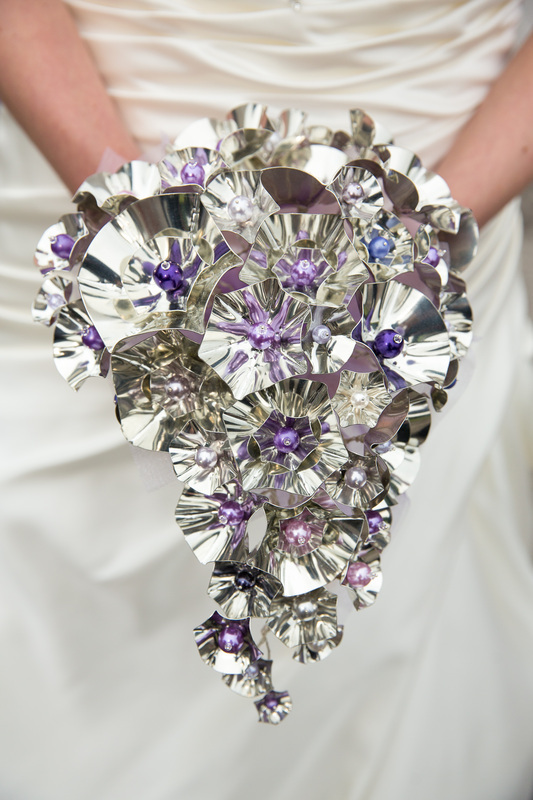 I can also use more smaller or larger Sequins and add other elements into the bouquet for you. When I got married I wanted a bouquet that I could treasure long after my wedding, a piece of jewellery to add to the 'wow factor' of my entire outfit. Jewellery for myself and the bridesmaids also matched my bouquet, as did the hair pins and the embellishment on my handmade veil. If you are interested in matching sets for your entire bridal party do not hesitate in contacting me with your particular requirements as I can work out a package deal for you. Production time is approx. 6-8 weeks.